NEXT STORY Why Did You Pay so Much for that Pump Repair? The Ultra Clean Contamination Control Breathers are the perfect replacements for existing breather caps or air vents on fluid holding tanks, gearboxes, or reservoirs. 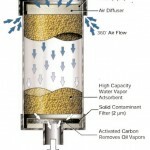 As this diagram (left) shows, when contaminated air enters the top of the breather, it passes through a self cleaning solid particle filter. The filter traps solid particles greater than 2 microns and keeps them from entering the breather and depositing on critical surfaces. The filtered air then passes through a bed of silica gel that adsorbs moisture in the air. During this step, up to 95% of the water vapor in the air is filtered out. Finally, the filtered air passes through an additional 2 micron filter in the bottom of the breather to ensure that no harmful particles will enter the tank or reservoir. 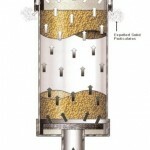 This three-stage filtration design ensures that equipment gets clean, dry air! The diagram on the right shows air being expelled from the reservoir through the desiccant breather. As the contaminated air travels this reverse path, expelled water vapors are adsorbed by the silica gel. 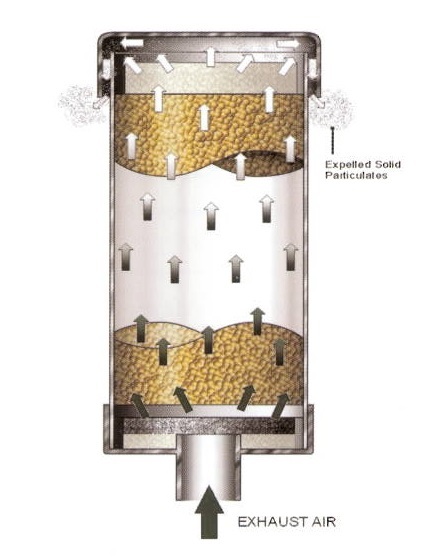 During the exhaust air-flow process, the silica gel indicates the presence of excessive moisture inside the reservoir as the gold gel turns to a dark green from the bottom of the breather rather than from the top. An unique feature of the Ultra Clean Contamination Control Breathers is the layer of carbon impregnated foam located on the bottom of most of our breather models. This carbon pad adsorbs small amounts of oil vapor exhaled from the tank and protects the silica gel from minor oil mist contamination. As the exhausted air passes back through the self cleaning 2-micron filter located in the top cap of the breather, any particles that were trapped as air entered the system are no back flushed from the filter. 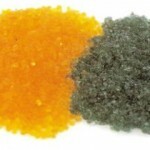 As the color indicating silica gel adsorbs moisture it changes from gold to dark green. When the silica gel has adsorbed to full capacity (up to 40% of its original weight! ), the gel will turn dark green. This color change is easily seen and serves as a visual indication that it is time to remove and replace the disposable breather. 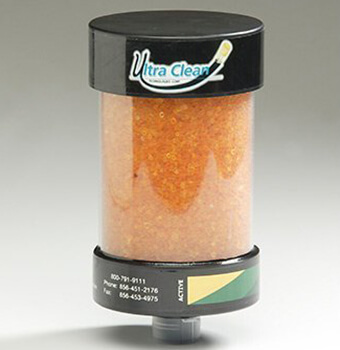 Take a look at our Contamination Control Breathers here!